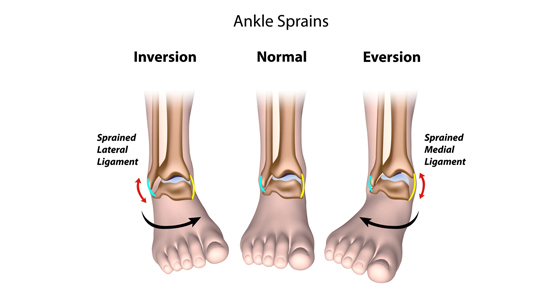 Ankle sprains are very common.They occur in many of our favourite sports like soccer and running. They can also occur from simply stepping on tree root. The most common way that ankle sprains occur is by rolling the foot so the sole faces the opposite leg. This is called an inversion sprain. There are three ligaments, or thick bands of tissues, that join the outer leg bone, the fibula, to the bones of the foot. When you get ankle sprains, you can stretch or tear all three of these ligaments. This results in stiffness, swelling and pain! What should you do? If you are unable to walk on it immediately following the injury, try again 5 minutes later. If you are still unable to walk on it, seek medical attention immediately. It is important that you make sure you did not break a bone. If you can walk on the foot, even with a limp, then the treatment for the first 48 hours is rest, ice, compression and elevation. Although there has been a lot of discussion lately regarding ice, it is still the best option for a new injury, especially a new injury that swells. If discomfort, stiffness and limping lasts more than three days then a referral to a physiotherapist is appropriate. Physiotherapists will use modalities to decrease swelling. They should also use manual or hands on techniques to increase movement of the foot and ankle. Exercises are critical. Strengthening will help to build muscle around the foot. Balance exercises will help to restore the balance reflexes of the foot and leg. This is a critical component of preventing a second injury to the ligaments. If you are an athlete (even a weekend warrior), proprioception exercises will also help you return to sport earlier. Physiotherapists can also help you to determine if bracing would be helpful, and if so, which one.